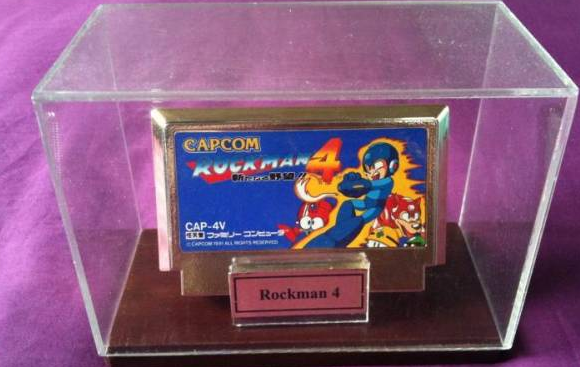 We've all heard the tale of the legendary golden Rockman 4 cartridges. 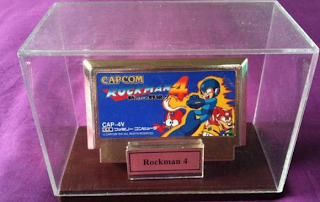 Distributed exclusively to the Rockman 4 boss contest winners, there's only eight of them in the whole wide world. So far, we only know the whereabouts of three: one at Osaka's Super Potato, another in the hands of Bright Man creator Yoshitaka Enomoto, and lastly, Ring Man creator Hiromi Uchida. But wait! There's something shimmering from the halls of Yahoo Auctions Japan. Why, it's another golden cartridge! Oh boy. Could this really be cartridge #4? After all, it's touting a fancy display case. All the more legit, right? Not so fast, partner. According to our friend CAP Kobun, we're looking at a bone fide fake. The cartridge's seller, mechayasuii, has a history of selling pirated software and reproduction cartridges. Worse yet, the auction is being flooded by bidders. No one knows if these are bots (to make the auction seem more legitimate than it really is), or actual bidders falling for an unfortunate deception. It's a sticky situation either way. With rarities like this, you always have to be careful. Certainly Yahoo Auctions, is a cool place to acquire rare goodies and trinkets. But with this sort of stuff, it's best to exercise caution. Now, I don't believe we've ever found a physical flag to verify the authenticity of the gold cartridge. Right now, your best bet would be to carefully research the seller's history. Better safe than sorry! Thanks the warning, CAP Kobun! This is a little off-topic, but on that old Atomic Fire interview the original submitted art for Bright Man (Pearl Man) is shown. Does anyone have images of the other original submissions for Robot Masters? (besides what is shown in Mega Man 8's credits) I would love to see them! There is a way to tell if it's real (Capcom's only little silly thing) but I will keep that info between you and me Brain, if known the bootleggers would use said info. What's kind of interesting is a lot of these names showed up in later games. I have a fair amount of original robot submission info. Very little of it is on the web. I'll put up a proper article when I've got it organized to my satisfaction. I don't care if it's fake, I want it. I mean, it's the closest thing to having the gold cartridge anyway. Counterfeit cart sellers don't bother to paint, or even show, the cart slot.